Les Couleurs de lOrient is located two minutes from the famous Jemaa el Fna location. Riad is a lot more than 200 years old, authentically decorated inside the purest Moroccan tradition; we are near the museum, restaurant, and Souk. Inside the Riad, guests can look forward to atmosphere music, free wi-fi, no cost linen and friendly employees. We can arrange your excursions. Das Hotel/Riad ist sauber und sehr zentral gelegen - nah beim Hauptplatz Jeema el-Fna - und doch ruhig. Das Fr&uhst&uck war ausgezeichnet und zum Empfang gab es ein Glas Tee. Die Dachterasse mit Blick &uber die D&acher der Stadt und einladenden Tischchen und Sofas ist toll. Location is perfect. Really close to primary square Djama El Fna. Really warm and friendly employees Mohamed and Abdul, clean, no cost tea all of the time, 24hour hot water, nicest garden to sit as a living room for several hours. Hammam was great. 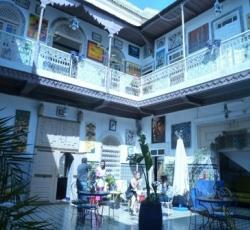 Beautiful riad with warm and friendly owners. Extremely close to primary square. Everything was perfect. I stayed inside the private room with my partner and two of our friends stayed inside the dorm room. Everyone had a great time. i would strongly recomend this establishment. Everything was perfect. I stayed inside the private room with my partner and two of our buddies stayed inside the dorm room. Everyone had a exceptional time. i would strongly recomend this establishment. Very nice and fantastic location. The staff was really friendly. The rooms were really nice and clean. Very nice and great location. The employees was really friendly. The rooms were really nice and clean. * Auberge Les Couleurs De L'orient rated 4.3 out of 5 based on 10 customer reviews. Hostel reviews with a star rating are sourced from HostelBookers. If you find Auberge Les Couleurs De L'orient with the same booking conditions at a lower rate somewhere else on the internet after you have booked, we will refund you the total difference.